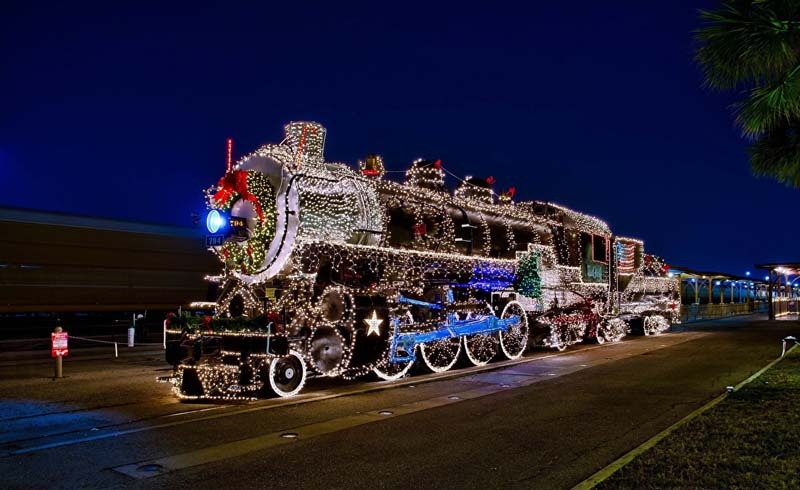 These holiday-themed train rides will get you in the spirit. There’s something magical about steaming through a snow-capped winter wonderland on a vintage train. Perhaps it’s because Santa rides through the air in a sleigh—or maybe there’s just something about vintage locomotives that seems so magical. Whether you’re feeling nostalgic, romantic, whimsical, or a little bit of everything, there’s no reason you can’t watch the season pass through from a train car window. Bundle up in your comfiest jacket and zoom through the snow, slipping through mountain passes or riding along the “North Pole,” dressed in thousands of lights timed to seasonal tunes. These seasonal train rides will please every member of your family. History lovers can hop aboard the New York City’s old-school subway cars to see a glimpse of the bustling city Berenice Abbott photographed. And romantics may enjoy a midnight trip through the Georgia hills on New Year’s Eve—complete with bubbly. Go ahead: grab a mug of hot cocoa (it might even be spiked) and say hi to Santa. And don’t forget to bring the kids along. Well-behaved little ones might score a candy cane from a generous elf and get facetime with jolly old Nick himself. These seven holiday train rides offer a cozy, wintry sleigh ride for every rider. It’s a holiday miracle: Travel back in time on New York City’s Holiday Nostalgia Train. No, you won’t meet the ghosts of Christmas past, present, and future, but lucky riders can imagine the city as it once was many winters ago. Lucky commuters will ride vintage steel R1/9 subway cars—dressed up with holiday wreaths and festive red ribbons, of course—which served the city from the ‘30s through the ‘70s. Take a peek at the old-school rolling signs to make sure you’re on the right line and grab a vintage rattan seat, a surprisingly comfortable way to enjoy the historic ride. Holiday parties are the best part of the season, and South Dakota’s 1880 Train figured out how to turn a festive celebration into a downright thrill: Serve those mugs of spiked hot chocolate while zooming down a railroad. Enjoy views of the Black Hills and former gold prospecting hot spot Battle Creek on this one-hour trip to the North Pole, where Santa waits for your arrival. History enthusiasts will enjoy riding the antique diesel locomotive as it chugs through the mountainside. 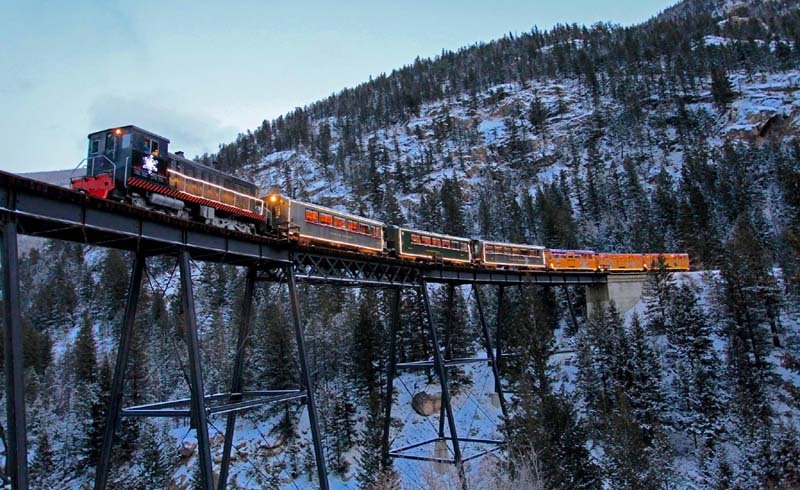 This winter, give your favorite kiddos a special treat: A one-hour train ride with Santa on the Georgetown Loop Railroad in Colorado’s Rocky Mountains. And unlike your resident mall St. Nick, this big guy comes bearing treats and goodies for your little one. But even presents might not be able to distract them from the majesty outside. These steam-powered “iron horses” travel through old mining country, crossing skinny bridges and snow-covered mountain passes, all the while winding through a synchronized light show. Santa’s a big-city boy, too—and rumor has it he just loves Chicago. The “L’s” annual Holiday Trains began as a cheerful way to deliver food to local charities. Now, it’s a can’t-miss event complete with two specialty trains. Jolly old St. Nick and his team of merry reindeer ride the Holiday Train, pulling into each station with a wave. And his helpers ride the Elves’ Workshop Train, where lucky commuters receive candy canes and priceless photo opportunities. Adorned with garlands and thousands of multi-colored twinkling lights, riders might just think their next stop is the North Pole. Rumor has it the way you celebrate New Year’s Eve dictates the course of your year. Leave 2016 behind for a far-better 2017 by ringing in the new year aboard the Blue Ridge Scenic Railway. Board your train at Blue Ridge, Georgia’s historic 1905 depot. Then, watch the moon rise over the Chattahoochee National Forest on this relaxing, two-and-a-half hour train ride. Your fare includes celebratory drinks, party favors, nibbles, and live entertainment—and something sparkly to toast with at midnight. Don’t let your celebrations end at 12:30. Stay in one of Blue Ridge’s many quaint bed-and-breakfasts to make this unique experience complete. You can’t ride Canadian Pacific’s holiday train—but you can come find the dressed-up locomotive as it rolls through Canada and the northern U.S. At each stop, door lowers to reveal performers like Kelly Prescott, Dallas Smith, and Jonathan Roy. After dancing and singing along to your favorite modern and traditional holiday songs, volunteers accept donations for local food banks. And then the train moves on: With more than 150 concerts planned, making sure everyone feels the holiday magic means a strict schedule. Want your holidays to feel downright Dickensian? Okay, fine, skip Oliver Twist’s sad soup kitchen and maybe ditch A Christmas Carol’s ghosts. Meet the rest of your Victorian-era Christmas needs on the Black River & Western Railroad’s Victorian Christmas Schedule. After departing from Flemington Station in eastern New Jersey, enjoy classic holiday caroling—sung by an era-appropriate chorus—and a nativity scene, accompanied by a retelling of the Christmas story. Tuck into some cookies and hot cocoa while your kids sidle up to Santa on this two-hour journey along this vintage, 1854 railroad.